Doc Martin is filmed in the village of Port Isaac and it’s neighbour Port Gaverne. You will recognise a lot of story locations in these two places. Interior scenes are sometimes filmed inside real properties, but I understand that other scenes, including the surgery are filmed in a studio barn nearby. It’s easy to spot the houses in Port Isaac where Louisa and the Doc have lived, as well as the primary school, now a hotel. Mrs Tishell’s chemist and other places are also easy to recognise. Other places have changed and sadly the hotel in Port Gaverne is derelict and looking very dilapidated. When the Doc sets off to Truro he often crosses Bodmin Moor, which makes no sense geographically, but is great for dramatic scenery. Some of his patients are located in the middle of nowhere on Bodmin Moor. So there must be a good location finder working on the show. St Breward pub was the ‘cottage’ where Louisa gave birth to James. The tiny roads which feature in the stories are everywhere and typical in Cornwall. Port Isaac was also used in 1970’s TV version of Poldark. 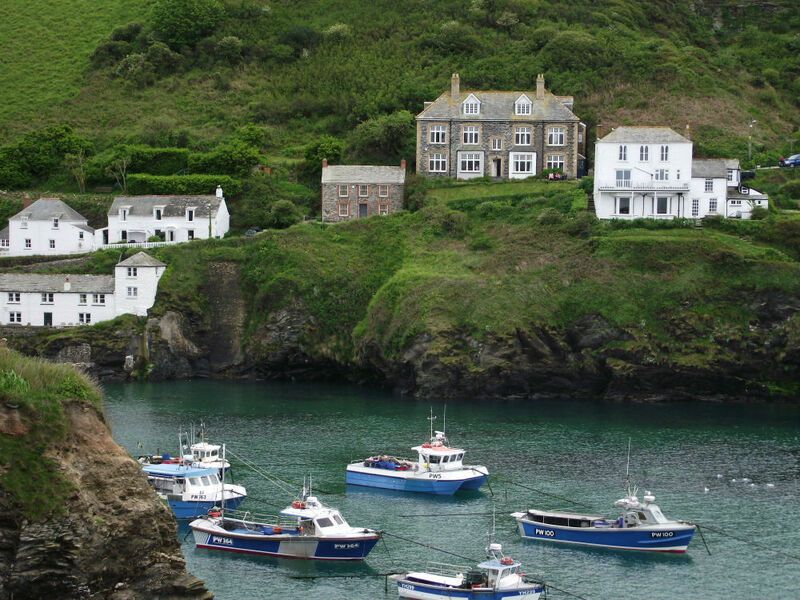 I am a fan too and love an excuse to visit Port Isaac! Nearly all the exterior scenes are filmed here, or ‘next door’ in Port Gaverne. It’s great fun spotting the residential locations and Mrs Tishell’s chemist is the local sweet shop! The village road is quite steep and slopes down towards the harbour area where it flattens out. If the road is too steep for you, I can get the Land Rover down to the harbour to drop you off. I’ll come back to meet you and explore the village. Squeezy Belly Alley is just how it sounds and it’s fun to wander around the narrow streets and peak into the shops. There’s a good pottery studio on the way up to the Doc’s house. Nathan Outlaw also has two establishments in the village, best to book ahead for these. The Fish Kitchen is the more casual of the two offering fantastic tapas style fish dishes. The tour need only take a half-day. For a full day we can add on other locations, maybe a taste of Bodmin Moor. The Doc often travels across the moor on his way to the latest drama. This could include a visit to the pub where baby James was born. It’s also easy to fit in a trip to Tintagel. We can visit the castle and other historic locations in the village. The tour theme then combines two great heros King Arthur and the Doc! How Much is a Doc Martin Tour? Please contact me and let me know if you need a half-day or a full-day, what you would like to combine into your tour and where you are staying.